But, perhaps the most striking element of Danger 5 (specifically season 1) is the drinks that fuel the commandos in their resistance to the vile dictator. Imagine the hip highballs of the sixties served with a sidecar of LSD. And the writers are generous enough to share the recipes to some of the swingin’est cocktails (although always at a staggering cost to bartender Pierre). 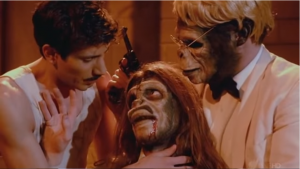 Now, if you’re [Insert Gender Identity Here] enough, you can join the Danger 5 team. Do it while binge drinking one, and preferably more of the mixed up mixed drinks below. Enjoy, and as always…hill Hitler!